There are numerous nice hotels in the Aegean and Mediterranean region that are regarded as the holiday heaven of Turkey. These hotels are flooded with domestic and foreign tourists in the summer months and they offer various activities and a fun holiday. No doubt, it’s not easy to choose the best hotels considering the high amount of them. Therefore, I’ve made this list based on the reviews and points given by the customers. I hope this post will help you find the right hotel for you. 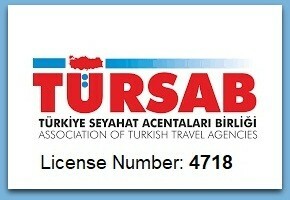 So, let’s get started and begin our Best Beach Resorts in Turkey list. Hillside Beach Club Fethiye is located in the Mediterranean region’s one of the most scenic bays in Fethiye which boasts a Blue Flag beach. At Hillside Beach Club Fethiye, you can practice motor and sailboat sports, attend a diving school, and join an art workshop. Additionally, some fun options like pool bar and beach bar are also available for the guests. You can enjoy delicious dishes from Turkish and world kitchen at the hotel’s restaurants. Moreover, Baby Chef serves young guests. If you prefer light food, there are tons of options too. Breakfast, lunch, and dinner are served in an open buffet style at Hillside Beach Club Fethiye. You can choose to stay in one of its rooms with the sea view or choose one of its bigger rooms for families. These rooms have a special balcony for its guests. Hilton Dalaman is one of the best hotels to choose from if you wish to go on holiday as a family. In Hilton Dalaman, there are special pools and entertainment sections for kids. Moreover, the animation team of the hotel organizes amazing shows to keep the kids busy while their parents can enjoy their meals or the pool. Therefore, Hilton Dalaman is one of the best holiday resorts in Turkey for families. Additionally, the hotel also serves as a spa. Therefore, it’s fully equipped to provide a very comfortable stay. You can get massage from a professional Asian masseur or try the steam room and sauna. You should also note that Hilton Dalaman was awarded the Best Honeymoon Hotel in Turkey for a few times consecutively. If you make a reservation with a special package that is exclusively for the newly married couples, you are welcomed with champagne and you are highly pampered during your stay. It often happens to see the staff asking how you are doing many times as they want to make sure you have a good time there. As Hilton Dalaman is the hotel I chose for my honeymoon, this hotel has a special place on this list. The reason is the perfect service and attention shown during my stay at Hilton Dalaman. The only negative side of Hilton Dalaman is that when you compare Sarigerme Beach to many other beaches in Bodrum and Antalya, it doesn’t look so attractive. However, the pool inside the hotel makes up for this minor issue. Xanadu Island is located in a small town named Akyarlar in Turgut Reis (Bodrum) on a special peninsula. The hotel adopts an all-inclusive style and attracts visitors from all around the world. Xanadu Island offers premium and royal villa options. Thanks to its special architectural style, all of its rooms in villa and suite styles have the sea view and it’s only 30 km from Bodrum, which is famous for its vibrant nightlife. 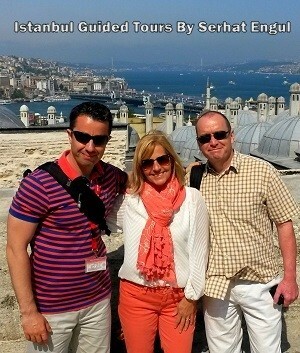 You can also visit Istankoy Island that is opposite to the peninsula via Turgut Reis or Bodrum ports on a daily basis. If you love performing arts, you should definitely watch the dance shows performed by a professional animation team at the amphitheater both day and night time. Additionally, a diving school, beauty center, kids club, water sports station, indoor and outdoor pools, kids and adults pools are also among Xanadu Island’s facilities. Xanadu Island is the best luxury holiday resort in Turkey. 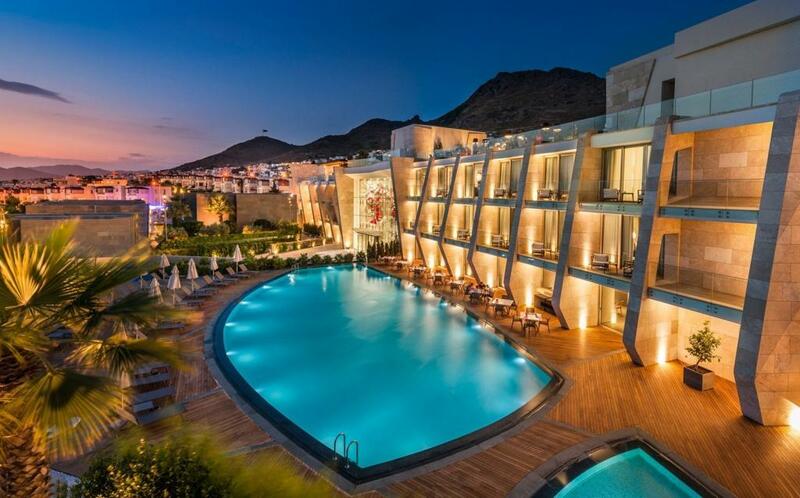 Titanic Deluxe Bodrum is on an 80,000 sq. meter area at Guvercinlik Bay in Bodrum and it also includes a 350-meter coast. The hotel draws attention with the restaurants managed by skilled chefs and delicious dishes. Titanic Deluxe Bodrum is along the beachfront and it offers a comfortable and fun stay. You will definitely have fun while listening to famous Turkish singers, live DJ performances, beach parties, dance performances, and other activities at Titanic Deluxe Bodrum. In addition to its rooms that have the sea view, you also have exclusive, superior, and presidential villa options. Titanic Deluxe is one of the best holiday resorts in Turkey for couples due its colorful nightlife. Vogue Bodrum is located on the Bodrum peninsula in Usuluk Bay. Apart from its superior rooms, it offers family suits that have big gardens or terrace. Vogue Bodrum is an ultra all-inclusive hotel where you can try delicious dishes from world kitchen as well as a diet menu, and baby & kids corner in its main restaurant too. A pool and beach, beach volleyball, billiards, diving school are the facilities and activities you can enjoy at Vogue Bodrum. Moreover, a game room and a movie theater will make your stay at Vogue Bodrum even more fun. Its spa center designed in Ottoman concept, with a 3,000 square meter usage area, you can enjoy Turkish bath, Far Eastern and African massage, and Russian sauna. Additionally, you can also enjoy the hotel’s indoor pool, fitness center, and hairdresser too. Vogue Bodrum is definitely one of the best all inclusive resorts in Turkey both for families and couples. D Maris Bay Datca Peninsula offers 193 rooms and suite rooms, a duplex Presidential Suite, and a villa. It stands out with its simplistic design. The hotel also boasts five à la carte restaurants and seven bars. One of these restaurants is named Zuma where you can enjoy examples of modern Japanese kitchen. The other one is the favorite restaurant of meat lovers, Nusr-et. You can enjoy water sports, tennis school, and yachting as well as five special beaches with different concepts. Its biggest beach is a blue beach named The Bay Beach where you can also enjoy such restaurants as Ruia, Bellariva, and Nusr-Et, while Il Riccio Italian restaurant at Il Riccio Beach is an option if you like Italian food. D Maris Bay Datca Peninsula also offers heated indoor pool and a vitality pool. Moreover, you can also take advantage of Clean & Lean, the first full concept center where special diet protocols and exercise programs are applied by Bodyism experts. 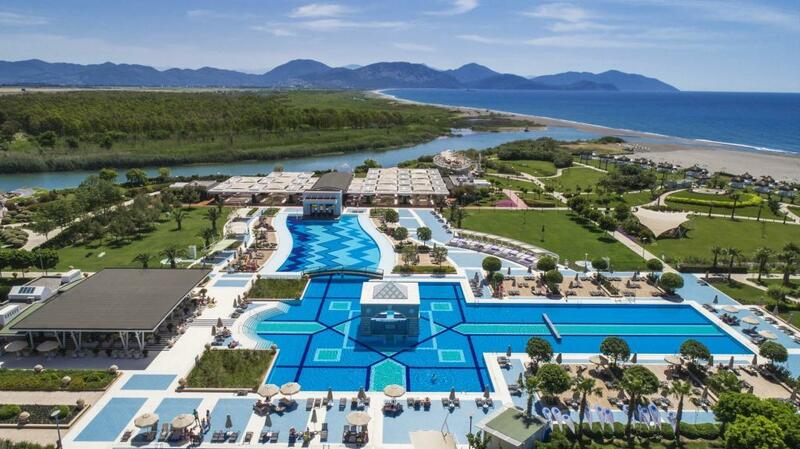 D Maris Bay is one of the luxury holiday resorts in Turkey. 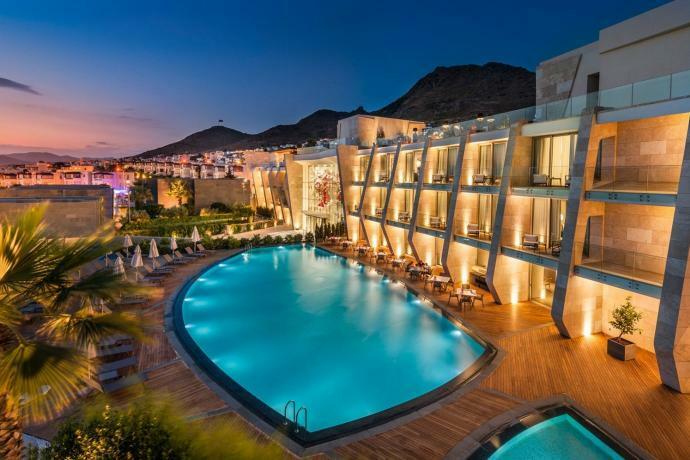 Swissotel Resort Bodrum Beach is located by Turgutreis coast and it offers 60 rooms that have the sea view and 6 suits on its two-floor building. You can try international dishes and the most popular Turkish cuisines at Café Swiss next to the beach at the hotel. 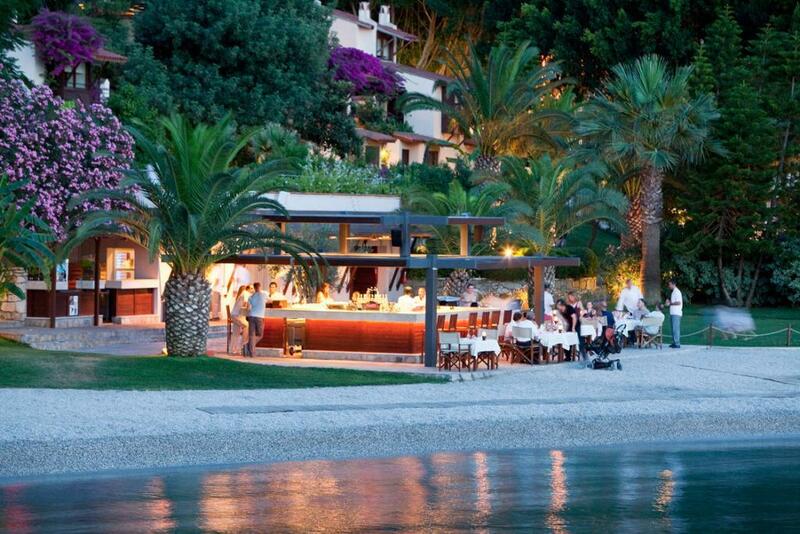 If you don’t want to stay away from the seaside, you can also try the gourmet grilled food at The Beach Restaurant. Moreover, you can have your dinner at Yuhi Restaurant where you can enjoy Bodrum view too. After your dinner, you are recommended to drink a cocktail and listen to music at The Roof Bar. 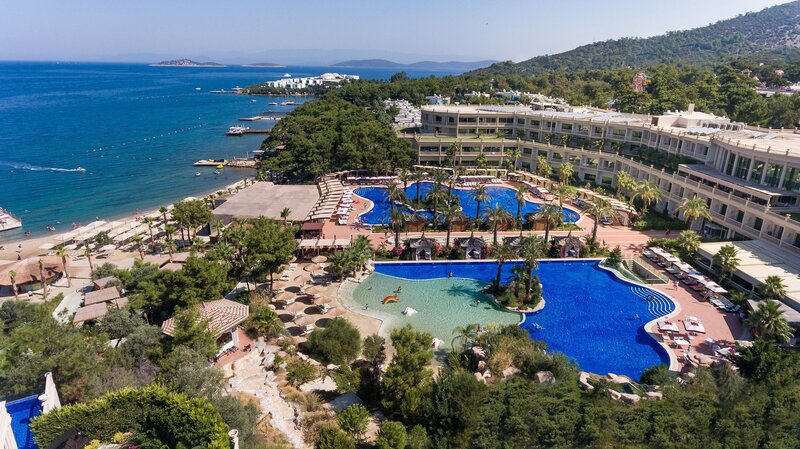 Swissotel Bodrum is best all inclusive resorts in Turkey. Rixos Premium Belek is on a 405000 square meter area and it includes a 700 meters long beach and 12000 square meter water park as well as a big spa. Rixos Premium Bebek boasts seven restaurants and eight bars where you can enjoy Italian and Turkish food, fish, steak, á la carte service and rich open buffet that draws attention thanks to its delicious examples of world kitchen. The hotel also organizes night shows where world-famous DJs perform. Moreover, a luxurious sitting area where international shows are held and a Show Center that has been recently renovated with the latest technology, light and sound systems are also impressive. Rixos Belek is one of the best holiday resorts in Turkey. Mountain and the sea are intermingled at Nirvana Lagoon Villa Suites & Spa where you can stay in one of its standard, VIP, Top VIP rooms or in one of its spacious villas among pine trees with a pool inside a garden. You can enjoy Turkish, Far Eastern, Mexican, and Ottoman kitchens at its special a la carte restaurants in addition to its bars with different concepts. Daily activities are also held at Mini Club, Maxi Club, and Teenage Club at Nirvana Lagoon Villas Suites & Spa. The hotel’s 900 meters long beach, three piers, and pavilions make sure you will enjoy the sea endlessly. 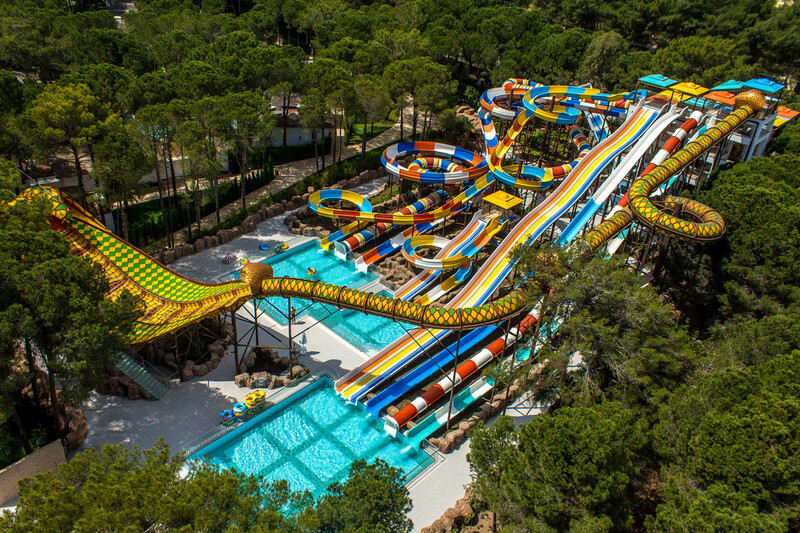 In addition to the beach, you can also have fun at Naja Naja Aquapark that is 2700 square meter high and filled with the sea water and slide on its 11 different types of slides. Turkish Bath inspired by the hamams in the Ottoman palaces is available at Turkish Bath & Spa. Facial massage after hamam is also available at Nirvana Lagoon Villas Suites & Spa. It is definitely the best place to go in Turkey for families. Maxx Royal Kemer Resort boasts rooms starting from 100 square meters with specially designed suite rooms and private villas that accommodate a pool on the beachside. 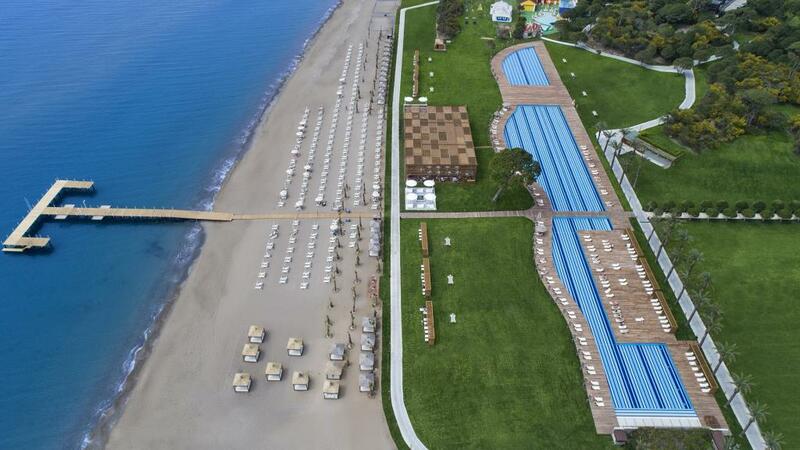 Maxx Royal Kemer is surrounded by pine trees by two bays and in the middle of 400 meters long special beach. 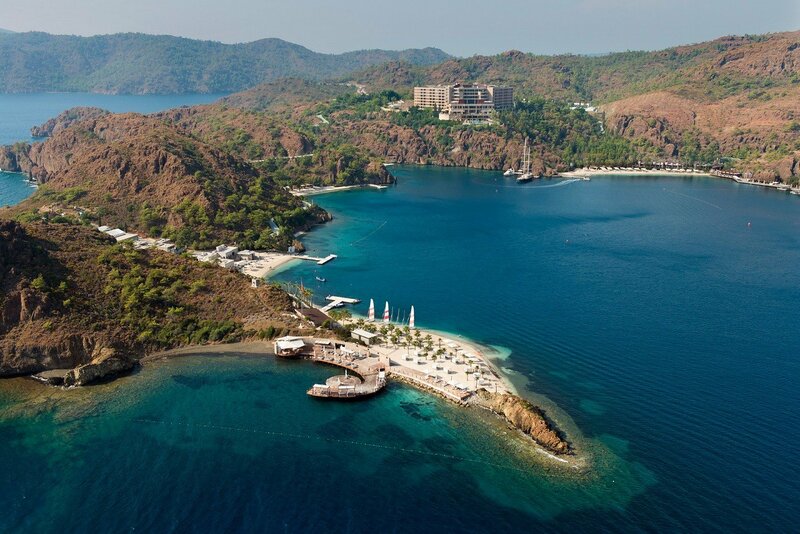 Its main pool, heated sea water pool, Laguna beach and kids beach guarantee a fun stay at Maxx Royal Kemer Resort. Middle Bay Beach at the hotel is suitable for kids to swim. Moreover, activities for any age group are organized on a daily basis at Maxx Royal Kemer Resort. You can play tennis, do water sports, paragliding or learn yoga, cross fit, and pilates at Maxx Royal Kemer Resort too. 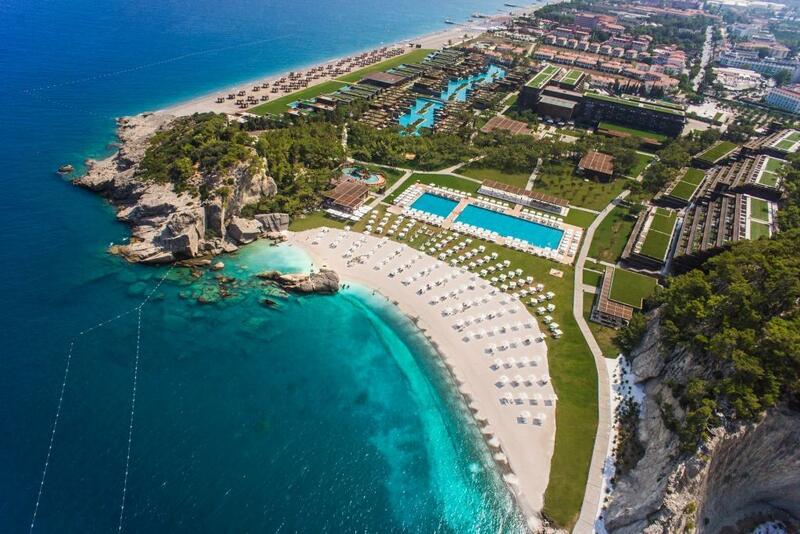 Maxx Royal Kemer is considered as one of the Best Beach Resorts in Turkey for families and young couples.